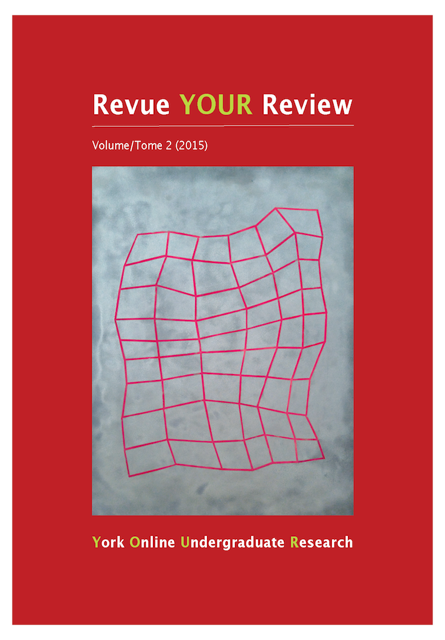 York University Libraries announces the second and third instalments of the e-journal Revue YOUR (York Online Undergraduate Research) Review, an annual academic journal offering a professional, peer-reviewed forum for the publication of York undergraduate students’ research. The journal is multidisciplinary, bilingual, and open-access, and is associated with the Undergraduate Research Fair hosted annually by the Libraries and supported by the Office of the VPRI. 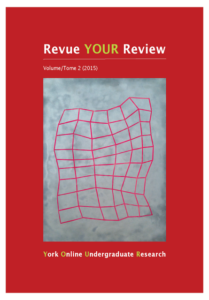 Read it online at http://yourreview.journals.yorku.ca/. 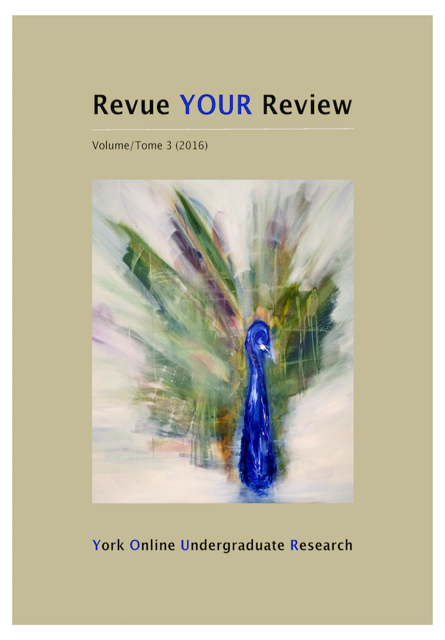 Articles that appear in Revue YOUR Review are re-elaborated versions of essays that have first been submitted as graded coursework and subsequently accepted for poster-presentation at the juried Undergraduate Research Fair. Journal submissions are subjected to a rigorous process of substantive editing requiring student-authors’ participation at every step. Revue YOUR Review’s multi-tiered approach, in fact, begins before the submission stage: all participants whose work has been accepted for exposition at the Fair are subsequently invited to attend a “Writing for Publication” workshop, in anticipation of proposing for publication the product of their research; then they are encouraged to submit their work for formal consideration. Upon the conclusion of the review process undertaken by the editorial board, accepted works undergo initial copy-editing provided by students of a fourth-year professional-writing course, an activity designed to serve as an experiential component for those enrolled in the course. From there, authors are paired with “writing coaches” drawn chiefly from the editorial board—but also from specialists elsewhere—and enter into dialogue with them on strategies for improving, refining, and solidifying their writing style and their general argumentation. Next, articles are delivered to the editors-in-chief, who embark on a final review where they offer any additional substantive counsel to authors that might contribute to enhancing their articles’ academic value. Relative to volume 1, which is heavy in social criticism from urbanistic, environmental, artistic, gastro-discursive, political, and race-theoretical perspectives, the most recent instalments expand the breadth of investigations to the domains of kinesiology, psychology, and economics, while further developing within some of the disciplines broadly represented in the inaugural issue. Between volumes 2 and 3, certain currents have emerged: the science of exercise, the body, and health; identity, culture, and history beyond Anglo-normative Canada; psychology and adolescent development and behaviour; race and society; gender and sexuality; music, literature, and drama; corporate policy and social implications of the internet and interactive media technologies. This distribution embraces methodologies characteristic of disciplines from physical and human sciences to humanities, business, and social sciences. Volumes 2 and 3 also reflect and support the extension of the Fair into the fine arts: each of the covers features the image of an award-winning artwork exhibited at the 2016 Fair-associated Art Walk. The Review completes the cycle of scholarly knowledge production and dissemination that typically begins in the classroom, in the laboratory, or in the field: The seed of an idea or critical observation transforms through processes of research, writing, abstraction, exposition, revision, and incorporation of new perspectives into a public intellectual asset conflowing with the greater body of human knowledge and discernment.